Watch Professor Real Estate® TV to learn Real Estate Resolutions from Professor Real Estate® Suzanne Hollander! Real estate success is not an accident, it happens when you take consistent action to build your real estate “super powers” every day. Click the video to learn the Top 3 Resolutions! Scroll down to read all 12 Real Estate Resolutions! 1. Read – “Read” is my favorite 4 letter word! Read everything, especially your contracts, leases, condo documents and mortgage applications. Someone might say to you, “you don’t have to read this, its standard.” That’s an indication you need to READ! 2. Ask – Some important questions: On what date do I exchange my $$ for the property? How long do I have to study the property before I lose my deposit? For how long am I bound to rent my apartment? Who pays if something breaks? How much are my mortgage payments? What if I sign the lease with my girlfriend and we break up? 3. Get Your Feet on the Street – If you want to start to invest property, get your feet on the street and get to know an area and see the properties for yourself, don’t rely on Google Earth! Walk it, drive it..alot! 4. Be a Detective – After Feet on the Street, find out the sale/rental rates so that you know a good deal when you see it! If you have a day job, build some research time into your schedule. 5. Be a Newsie – Pay attention to the news! Read the newspaper where you live/want to invest so you know the players, trends, new development and risks. Save the articles you think are important. 6. Be a Bookworm – Read a one real estate book a month. There are hundreds out there! Contact me for recommendations! 7. Build Super Credit – Lenders look at your credit before they give you money to buy real estate! Order your free credit report to make sure its accurate and pay off your bills on time! Contact me to learn how! 8. Do Some Math – Make sure the deal you are looking at makes sense. If it’s income property, does the rent cover your expenses of owning – mortgage payments, property taxes, insurance, maintenance and vacancies. If it’s a condo, can you afford the monthly maintenance/mortgage payments along with property taxes? 9. Say No, Sometimes – Sometimes you need the strength to say no because after you used your Detective, Math and Reading powers a deal just doesn’t work for you. 10. Say Thank you, All the Time – A big superpower people sometimes forget is to say “thank you” even if the deal doesn’t work. Say thank you to all the participants, the seller, banker, lawyers and real estate agents. They will remember it. 11. Leave the Door Open – Using your “Super Power Thank you” leaves the door open for further negotiation or future deals. 12. Stick To It…Don’t Give Up! – Super heros never give up ! Build your real estate powers day by day. On a consistent basis read and analyze deals and you will slowly but surely build your real estate success! Learn Something Real Estate! Professor Real Estate® offers real estate consulting, education to you and your company, live and online. Professor Real Estate® TV offers quick real estate lessons everyone can understand and apply! Also, contact Hollander Realty, LLC, Lic. Real Estate Broker, for purchases and sales of property – services delivered in a confidential lprofessional business manner. 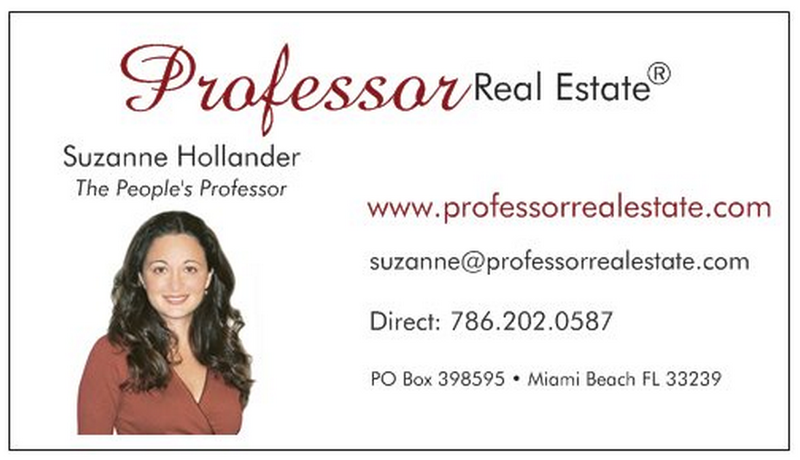 Hit “Like” Professor Real Estate® on Facebook! Disclaimer: Professor Real Estate® written materials apply generally to real estatesubjects and are not intended to apply to specific legal issues. Copyright Professor Real Estate® Suzanne Hollander 2014. ¡Professor Real Estate® siministra servicios educativos y de consulta para las inversions inmobilarias para usted y su negocio, en persona o por conexion electronica!